"Laugh, laugh! ", the masters of laugh parade! Enliven the gods with laughter! 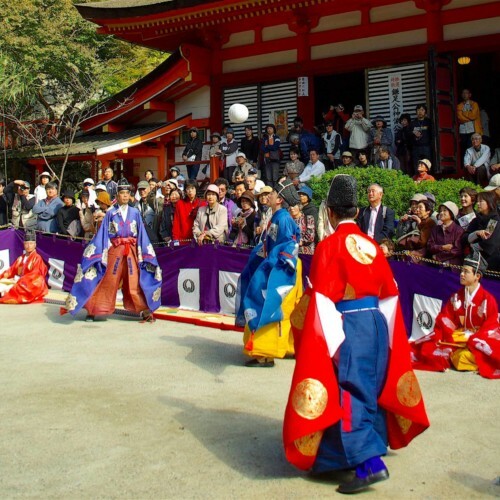 The unique Nyu Matsuri, with over 200 years of history, is also known as the Warai Matsuri, or "Laugh Festival", as it is a time to bring in good fortune through laughter. 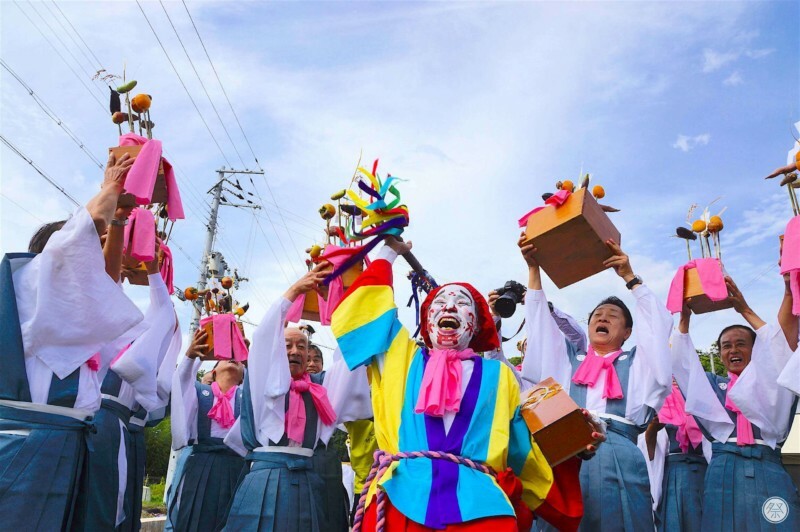 A "Bell Ringer" dressed in motley clothes and wearing white make up, leads the mikoshi (portable shrine) parade with bell in hand chanting, "Eeh Rakushaa, Yoh Rakushaa" (Ease at home. Ease throughout the world!). 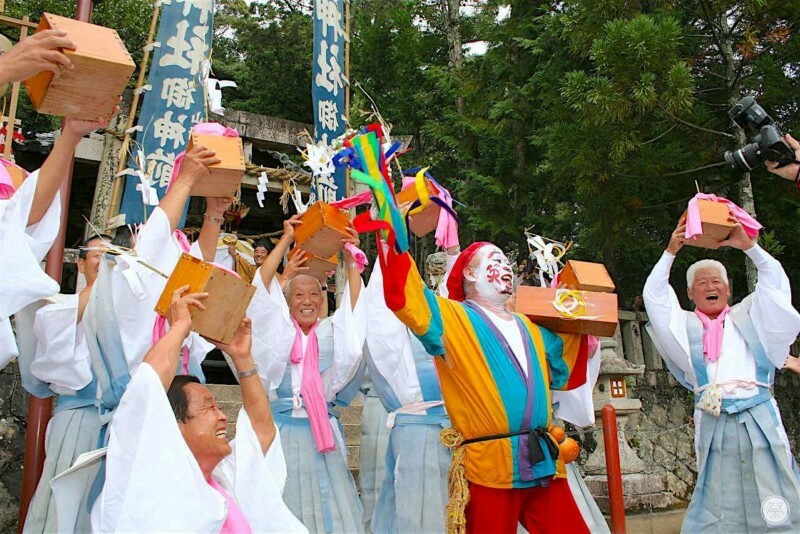 The origin of the laugh festival goes back to mythological times. Deities from all over the land had gathered in one place for a meeting, to which the local deity Niutsuhime-no-mikoto arrived late. After the deity became depressed due to her mistake, the local villagers tried cheering her up, marking the beginning of this festival. 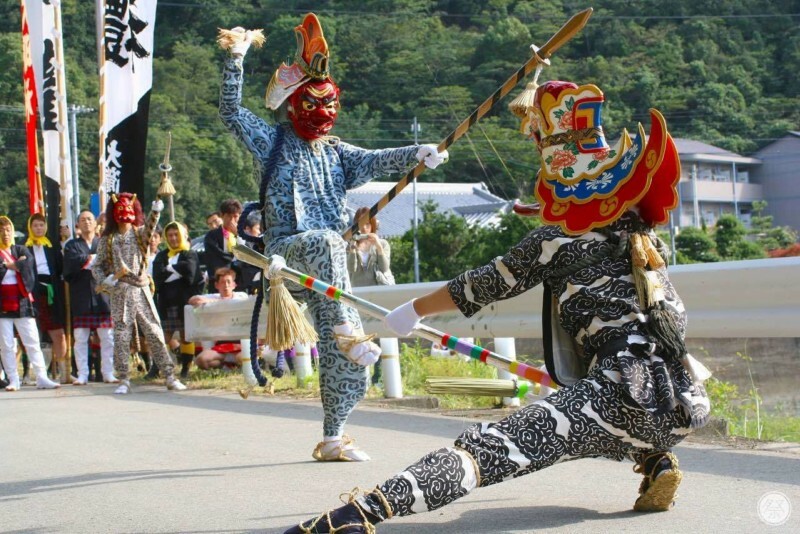 Shishimai (lion dance) and other traditional folk performances are held. The sound of laughter never stops echoing throughout. Feel the energy overflowing from the prayers of happiness made by locals in the middle of cheerful and lively antics. 1. Watch the meeting of the Demons, marking the start of the festival. 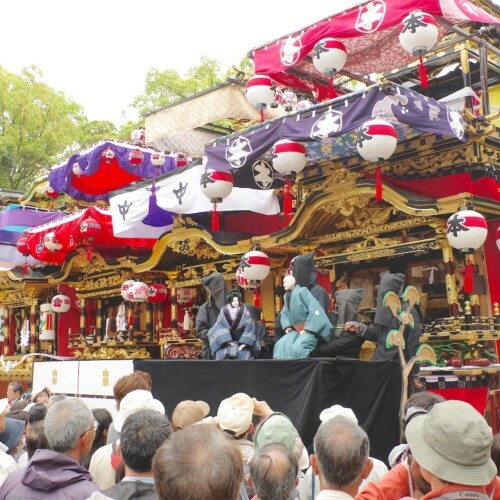 The first highlight of the festival is the very beginning at the "Meeting of the Demons". 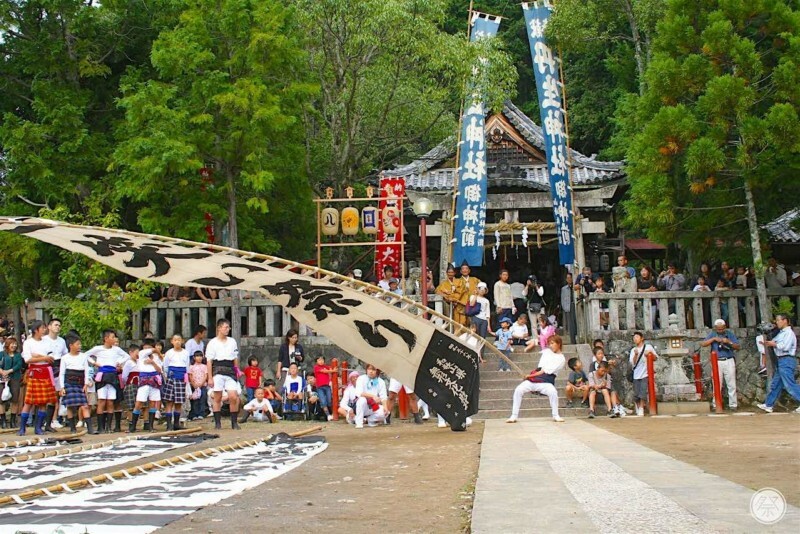 This festival is celebrated simultaneously by four regions of town. Demons representing each region gather to greet and perform. Enjoy a few solemn and valuable moments before everything turns jolly. 2. 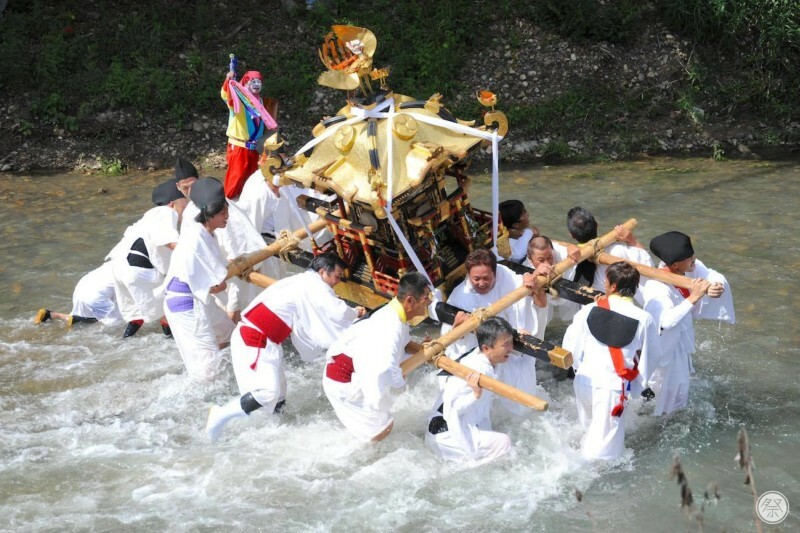 Behold the crazy journey of the meandering mikoshi. This procession that chants "Laugh, laugh!" sometimes veers off course to jump into a river. It is an incident-filled journey that is unreadable. The Bell Ringer that leads the way, as well as the mikoshi carriers, are seemingly ready to fall over in exhaustion at any moment but joyfully push on through, screaming and laughing. You won't be able to keep from laughing either. 3. Laugh to the end! 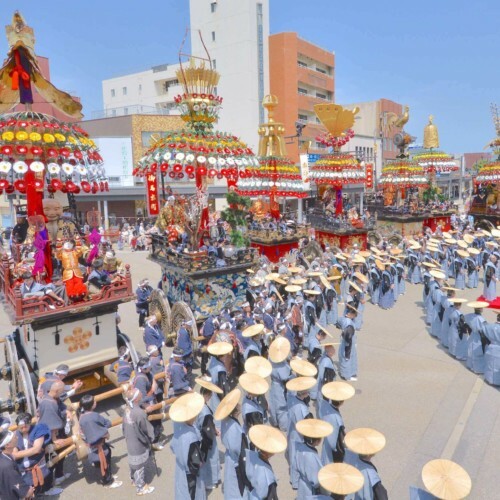 When the Bell Ringer and mikoshi return to the shrine, the festival reaches its climax. Each of the four regions perform their own original traditional dance and bring out the drum floats. 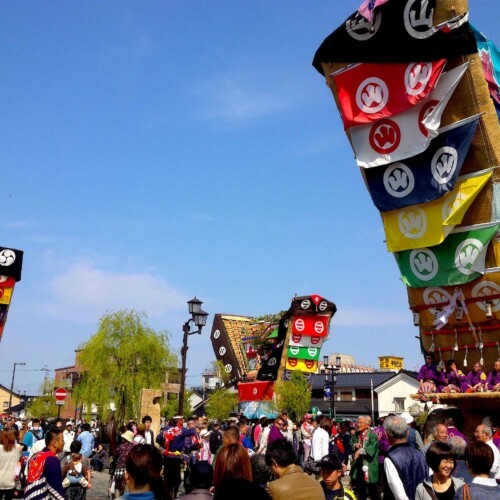 Large flags to celebrate the festival are raised to honor the deity. 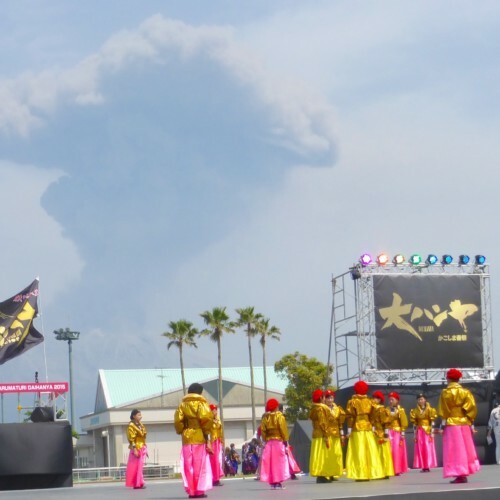 Finally, all regions perform their Shishimai (lion dance) together. This is a festival you can enjoy the whole day through. Please do not do anything that will disturb the festival procession (ex: disrupt walkways). The mikoshi carriers and other processions participants have drunk alcohol so please keep that in mind when approaching. Viewers are welcome to take pictures. Approx. 4km from Wasa Station (No employees at this station). It is also good to take a taxi from the Gobo Station on the JR Kisei Main Line (roughly 15min drive).